This article is about the quarterback. For the Simpsons episode, see Bart Star. Bryan Bartlett "Bart" Starr (born January 9, 1934) is a former professional American football player and coach. He played quarterback for the Green Bay Packers of the National Football League (NFL) from 1956 through 1971. Starr is the only quarterback in NFL history to lead a team to three consecutive league championships (1965–1967). Starr trails only New England Patriots quarterback Tom Brady for total NFL championships, with five. Starr led his team to victories in the first two Super Bowls: I and II. As the Packers' head coach, he was less successful, compiling a 52–76–3 (.408) record from 1975 through 1983. Starr was named the Most Valuable Player of the first two Super Bowls and during his career earned four Pro Bowl selections. He won the league MVP award in 1966. He was inducted into the Pro Football Hall of Fame and the Packers Hall of Fame in 1977. Starr has the highest postseason passer rating (104.8) of any quarterback in NFL history and a postseason record of 9–1. His career completion percentage of 57.4 was an NFL best when he retired in 1972. Starr also held the Packers' franchise record for games played (196) for 32 years, through the 2003 season. Starr played college football at the University of Alabama and was selected by the Green Bay Packers in the 17th round of the 1956 NFL draft (200th overall). Born and raised in Montgomery, Alabama, Starr's parents were Benjamin Bryan Starr (1910–1985), a labor foreman with the state highway department, and Lula (Tucker) Starr (1916–1995). Starr's early life was marked by hardships; shortly after the start of World War II, his father's reserve unit was activated and in 1942 he was deployed to the Pacific Theater. He was first in the U.S. Army but transferred to the U.S. Air Force for his military career. Starr had a younger brother, Hilton E. "Bubba" Starr. In 1946, Bubba stepped on a dog bone while playing in the yard and three days later died of tetanus. Starr's relationship with his father deteriorated after Hilton's death. He was an introverted child who rarely showed his emotions and his father pushed Starr to develop more of a mean streak. Starr attended Sidney Lanier High School in Montgomery, and tried out for the football team in his sophomore year, but decided to quit after two weeks. His father gave him the option of playing football or working in the family garden; Starr chose to return to the football field. In his junior year, the starting quarterback broke his leg and Starr became the starter. He led Lanier to an undefeated season. In his senior season, Starr was named all-state and All-American, and received college scholarship offers from universities across the country. He seriously considered the University of Kentucky, coached by Bear Bryant. Starr's high school sweetheart, Cherry Louise Morton, was planning to attend Auburn and Starr wished to attend a college close to her. Starr changed his mind and committed to the University of Alabama. During Starr’s freshman year, the Southeastern Conference – of which Alabama is a part – allowed freshmen to play varsity ball. Starr did not start for Alabama as a freshman, but he did play enough minutes to earn a varsity letter. His high point of the season came in quarterback relief in the Orange Bowl, when he completed 8 of 12 passes for 93 yards and a touchdown. Starr entered his sophomore year as Alabama's starting quarterback, safety and punter. His punting average of 41.4 yards per kick ranked second in the nation in 1953, behind Zeke Bratkowski. Alabama recorded a 6–2–3 record and lost in the Cotton Bowl to Rice by a score of 28–6. Starr completed 59 of 119 passes for 870 yards, with eight touchdowns that season. In May 1954, Starr eloped with Cherry Morton. The couple chose to keep their marriage a secret. Colleges often revoked the scholarships of married athletes in the 1950s, believing their focus should remain on sports. Cherry remained in Jackson, Alabama, while Starr returned to the University of Alabama. That summer, Starr suffered a severe back injury during a hazing incident for his initiation into the A Club. He covered up the cause by fabricating a story about being hurt while punting a football. He rarely played during his junior year due to the injury. The back injury disqualified him later from military service, and would occasionally bother him the rest of his football career. After a disappointing season of 4–5–2, Red Drew was replaced by J.B. Whitworth as coach of Alabama. Whitworth conducted a youth movement in Alabama for the 1955 season and only two seniors started for the team. While supposedly healed from the back injury, Starr rarely played in his senior season either. Starr played briefly in the Blue–Gray bowl of 1955. Johnny Dee, the basketball coach at Alabama, was a friend of Jack Vainisi, the personnel director of the Green Bay Packers. Dee recommended Starr as a prospect to Vainisi. The Packers were convinced that Starr had the ability to succeed in the NFL and would learn quickly. In the 17th round of the 1956 NFL Draft, Starr was selected by the Packers, with the 200th overall pick. Starr spent the summer of 1956 living with his in-laws and throwing footballs through a tire in their backyard in order to prepare for his rookie season. The Packers offered $6,500 (equal to $59,900 today) to sign Starr and he accepted, with the added condition, requested by Starr, that he receive $1,000 up front. Starr began as a backup to Tobin Rote in 1956 and split time with Babe Parilli until 1959, Vince Lombardi's first year as Packers coach. In that season, Lombardi pulled starter Lamar McHan in favor of Starr, and he held the starting job henceforth. The following season, the Packers advanced to the 1960 NFL Championship Game, but lost to the Philadelphia Eagles, Lombardi's only post-season loss as a head coach. The Packers returned to the title game and won in 1961 and 1962, both over the New York Giants. In 1966, Starr was named the NFL's Most Valuable Player by the Associated Press (AP), the Newspaper Enterprise Association (NEA) and UPI. Starr was responsible for calling plays when he was quarterback, which was then the norm. One of his most famous play calls was in the Ice Bowl against the Dallas Cowboys in the NFL championship game on the final day of 1967. Consulting with Lombardi on the sideline, Starr suggested a basic wedge play ― with a twist. Instead of handing off to Chuck Mercein as the play dictated (and unbeknownst to his teammates), Starr suggested he would keep the ball and run it in himself. Having enough of the bitter cold weather, coach Lombardi said, “Then do it, and let's get the hell out of here!" Starr almost broke down in laughter as he ran back to the huddle, but held his composure. The play worked. The Packers went on to beat the Cowboys 21-17. At the Orange Bowl in Miami, the Packers defeated the AFL champion Oakland Raiders 33–14 in Super Bowl II, Lombardi's final game as head coach of the Packers, who were favored by 13½ points. The 1967 Packers remain the only team to win a third consecutive NFL title since the playoff system was instituted in 1933. Starr's playing career ended with the 1971 season, having posted the second best career passer rating of 80.5 (First at the time was Otto Graham with 86.6). He had surgeries on his long-ailing throwing arm in July and August 1971, and saw limited action in his last season. Starr had originally planned to retire after the second Super Bowl win in January 1968, but without a clear successor and a new head coach, he stayed on; by February 1972 he was set for one last year. He participated in the team's spring camp in Arizona in April, then announced his retirement in July at age 38. Immediately after his retirement as a player, Starr served as the Packers' quarterbacks coach and called plays in 1972 under head coach Dan Devine, when the Packers won the NFC Central division title at 10–4 with Scott Hunter under center. He pursued business interests and was then a broadcaster for CBS for two seasons. When Devine left for Notre Dame after the 1974 season, Starr was hired as head coach of the Packers on Christmas Eve. Upon taking the job, he recognized the long odds of a Hall of Fame player becoming a successful head coach. Initially given a three-year contract, he led the Packers for nine years, the first five as his own general manager. His regular season record was a disappointing 52–76–2 (.408), with a playoff record of 1–1. Posting a 5–3–1 record in the strike-shortened season of 1982, Starr's Packers made their first playoff appearance in ten years (and their last for another 11 years). They defeated the St. Louis Cardinals 41–16 in the expanded wild card round of 16 teams on January 8, 1983, then lost to the Dallas Cowboys 37–26 in the divisional round the following week. He tallied only three other non-losing seasons as Packers coach. After a disappointing 8–8 finish the following year, Starr was dismissed in favor of his former teammate Forrest Gregg, who previously led the Cincinnati Bengals to Super Bowl XVI in the 1981 season and coached the Cleveland Browns before. On January 13, 1984, Starr was named the head coach of the Arizona Firebirds, a proposed expansion team for the NFL. The NFL never granted the would-be ownership group of the Firebirds a team. Starr was voted to the NFL Pro Bowl four times. He was voted NFL Most Valuable Player by both AP and UPI in 1966, and was chosen Super Bowl MVP in 1966 and 1967. He was inducted into the Pro Football Hall of Fame in 1977. He is one of six Green Bay Packers to have his number (15) retired by the team. The others are Tony Canadeo (3), Don Hutson (14), Ray Nitschke (66), Reggie White (92), and Brett Favre (4). Of the six, only Starr and Favre are still living. On October 17, 1970, President Richard Nixon spoke at a testimonial reception honoring Bart Starr in the Brown County Veterans Memorial Arena in Green Bay, Wisconsin. "We honor him as a very great practitioner of his profession, the proud profession of professional football," Nixon said. "And as we honor him for that, we honor him not only for his technical skill but, as I've indicated, also for something that is just as important: his leadership qualities, his character, his moral fiber ... But I think the best way that I can present Bart Starr to his friends is to say very simply that the sixties will be described as the decade in which football became the number one sport in America, in which the Packers were the number one team, and Bart Starr was proudly the number one Packer." Starr was elected to the Wisconsin Athletic Hall of Fame in 1981. Starr has an NFL award named after him. The Bart Starr Award is given annually, by a panel of judges, to an NFL player of outstanding character. Matthew Slater was the recipient of the 2017 award, presented in Foxboro, Massachusetts. 5 3 1 .611 3rd in NFC 1 1 .500 Defeated St. Louis Cardinals in first round. Lost to Dallas Cowboys in second round. Starr has been married to his wife Cherry Starr over sixty years. They had two sons, of whom the younger is deceased (1988, age 24, drug overdose), and three granddaughters. He is a Christian. In 1965, Starr and his wife Cherry helped co-found Rawhide Boys Ranch in New London, Wisconsin, a facility designed to help at-risk and troubled boys throughout the state of Wisconsin. Starr even donated the Corvette he received as MVP of Super Bowl II to help Rawhide during their early years. He and Cherry continue to be affiliated with Rawhide Boys Ranch as of 2017. Over the past few years, Starr suffered a number of physical ailments, including ischemic stroke, hemorrhagic stroke, a mild heart attack, seizures, and a broken hip. In June 2015, Starr's family reported that he has been undergoing stem cell treatment in a clinical trial. He managed to attend a ceremony at Lambeau Field on November 26, 2015 retiring QB Brett Favre's jersey number. At Super Bowl 50 in February 2016, the NFL held a pregame ceremony honoring the MVPs of all 49 Super Bowls. Although he wished to attend, Starr was not well enough to travel to the game and instead sent a videotaped greeting from home. ^ "NFL Passer Rating Career Playoffs Leaders - Pro-Football-Reference.com". Pro-Football-Reference.com. ^ Christopulos, Mike (December 25, 1974). "Open door policy pleases Bart's dad". Milwaukee Sentinel. p. 2, part 2. ^ Mooney, Loren (October 12, 1998). 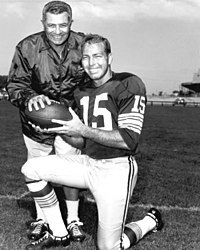 "Bart Starr, Green Bay Packers Legend". Sports Illustrated. Retrieved November 8, 2011. ^ Goodman, Joseph (February 29, 2016). "NFL legend Bart Starr was victim of 'brutal' secret Alabama hazing". al.com. Retrieved February 29, 2016. ^ "Bart Starr at ProFootballHOF.com". profootballhof.com. Archived from the original on December 11, 2007. Retrieved December 12, 2007. ^ "Bart Starr is Clearly Underrated". Bleacher Report. Retrieved July 26, 2013. ^ Lea, Bud (July 24, 1971). "Starr decides on surgery; will be on shelf 12 weeks". Milwaukee Sentinel. p. 1, part 2. ^ Lea, Bud (July 29, 1971). "Bart's surgery is 'routine'". Milwaukee Sentinel. p. 1, part 2. ^ "2nd Starr operation". Milwaukee Sentinel. wire services. August 14, 1971. p. 1, part 2. ^ "Bart Starr home after 2nd surgery". Florence Times. Alabama. Associated Press. August 19, 1971. p. 14. ^ "Green Bay's Bart Starr to retire at end of season; surgery aided shoulder". Gettysburg Times. Pennsylvania. Associated Press. February 1, 1972. p. 9. ^ Lea, Bud (April 8, 1972). "Packers shaky, but Starr shines". Milwaukee Sentinel. p. 1, part 2. ^ "Starr throws with 'zing' in workout". Milwaukee Journal. April 8, 1972. p. 16. ^ "Starr, 38, quits as Packer player". Milwaukee Journal. July 21, 1972. p. 1, part 1. ^ "Injuries finally end Bart Starr's career". Eugene Register-Guard. Oregon. Associated Press. July 22, 1972. p. 4B. ^ Lea, Bud; Hofmann, Dave (December 24, 1974). "Starr to be named today". Milwaukee Sentinel. p. 1, part 2. ^ a b Kupper, Mike (December 24, 1974). "Starr, Packers, make it official". Milwaukee Journal. p. 1, part 1. ^ Hofmann, Dale (December 25, 1974). "Starr pledges fresh start". Milwaukee Sentinel. p. 1, part 2. ^ Anderson, Dave (December 27, 1974). "Did Bart make mistake?". Spokesman-Review. Spokane, Washington. (New York Times). p. 20. ^ "Bart Starr a coach again - but without a team". Tuscaloosa News. January 14, 1984. p. 11. ^ "The Arizona Firebirds, a group seeking to bring a NFL franchise". UPI. January 13, 1984. p. 1. ^ "Green Bay Packers.com, "Retired Numbers"". packers.com. Archived from the original on April 4, 2008. Retrieved September 22, 2008. ^ "Richard Nixon: Remarks at a Testimonial Reception in Honor of Green Bay Packers Quarterback Bart Starr". www.presidency.ucsb.edu. ^ "Watch Matthew Slater learn that he is the winner of the Bart Starr Award". ^ Peterson, Eric. "Special gift for Rawhide Ranch". ^ Lea, Bud; Stephenson, Crocker (July 8, 1988). "Bart Starr finds son, 24, dead". Milwaukee Sentinel. p. 1, part 1. ^ Faust, Pete; Christl, Cliff (July 8, 1988). "Foul play not suspected in death of Bart Starr's son". Milwaukee Journal. p. 1A. ^ "ambassadors: Bart Star [sic]". Archived from the original on October 14, 2014. Retrieved October 8, 2014. ^ "Packers legend Bart Starr and wife, Cherry retiring from Lombardi Foundation". ^ Malcore, Paul. "The Legened of Bart Starr". www.rawhide.org. Retrieved February 14, 2017. ^ Rob Demovsky, "Bart Starr also suffered heart attack", ESPN.com. ^ Eilerson, Nick (January 9, 2016). "Packers legend Bart Starr recovering from broken hip after slew of health problems" – via www.washingtonpost.com. ^ Demovsky, Rob. "Packers great Bart Starr undergoing stem cell treatment". ESPN.com. Retrieved June 17, 2015. ^ "Brett Favre shares special moment with Bart Starr at Lambeau Field". ^ "Bart Starr not well enough to attend Super Bowl celebration".